I can’t remember the first time I had heard of those creatures. Probably when I was researching my trip to South America. Or when I was in Peru almost two years before, searching for monkeys in Puerto Maldonado. Whenever it was, the moment I learned of the pink dolphin, I knew that I wanted to see one. Dolphins were amazing creatures and what could be better than a freshwater one that was tinged pink? 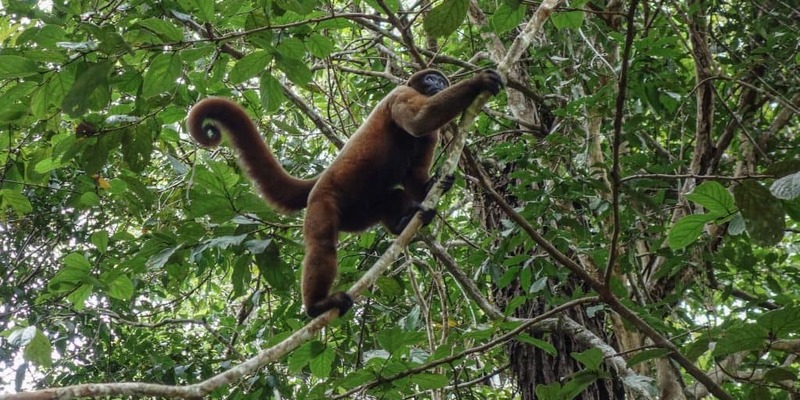 While these creatures may have played a huge role in my decision to visit the Amazon region in Peru and stay at a lodge a couple of hours away from Iquitos, there are many more reasons to plan a jungle trip in this country. I have mentioned the pink dolphins, but there are many more animals to see in the Amazon region. If you like wildlife, you have come to the right place. On our first day alone, we saw a monkey, several sloths and an iguana that was so green that even after five minutes of looking at it, I still mistook it for a leaf. The animal encounters didn’t stop there. I spotted not just pink dolphins but also another species of river dolphin (and I learned that the pink ones are, to be honest, quite ugly and look more like giant worms than anything else). While we drove through smaller rivers and channels, macaws flew above us. We even saw a toucan one day. When going wildlife watching, there is never a guarantee that you will get to see any animals. However, I think that the chances of finding interesting creatures in this area are very high. Plus, the guides often know where to look for them. Martina the spider monkey, for example, likes to hang around in the same area. She used to be someone’s pet and has been re-released into the wild, but after years of being close to humans, she has chosen her territory just next to a small village. Your jungle guide will know where to find these animals. What could be better than leaning back in a boat, watching the scenery pass by, while looking out for animals? The Amazon region is the perfect area to relax. 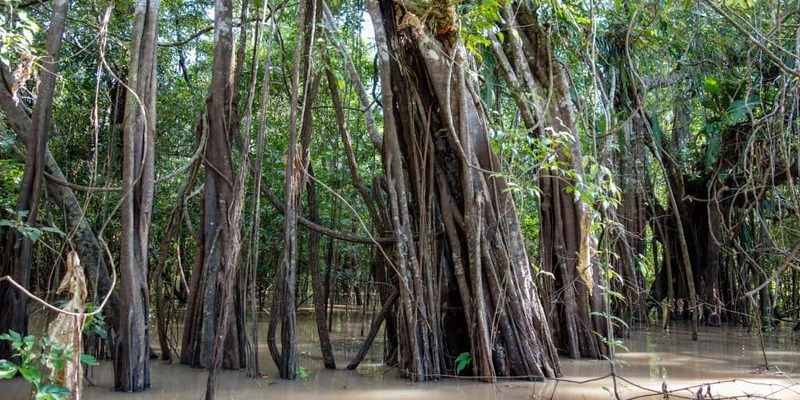 Since most territory is only accessible by water, especially in high water season, you will be sitting comfortably while waiting for a sloth to show up. With the wind, the temperature is just right, not too hot and not too cold, and mosquitos won’t bother you until the boat stops. 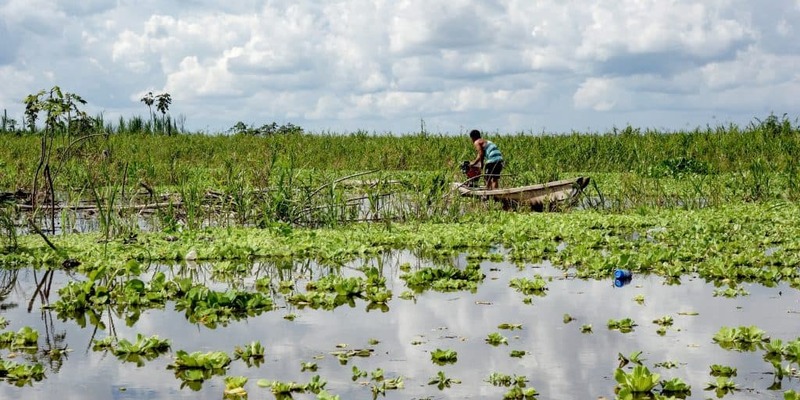 The Amazon region is just made for boat tours. They are not just relaxing, they also offer you a point of view that you would never get if you had to stick to walking trails. 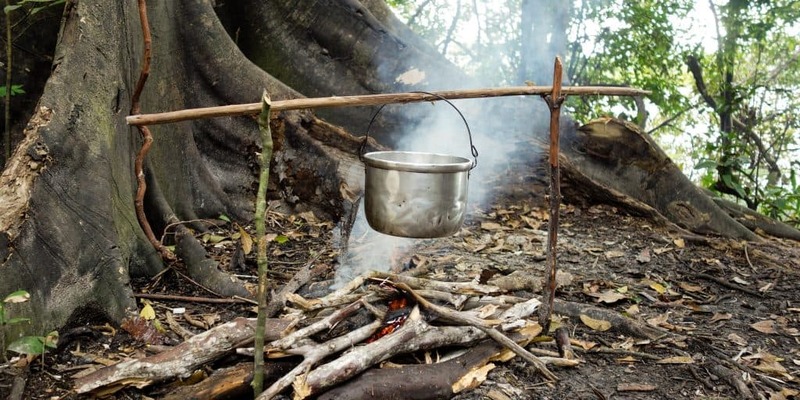 And if you want to move a little bit, ask your guide about jungle hikes. He will be able to take you on one. Just make sure not to forget your insect repellent, as those mosquitos can be vicious. I already mentioned that the boat rides on the Amazon and its tributaries offer an interesting point of view. The landscapes in this area are fascinating, especially if you arrive during high water season. I was here for my birthday, at the end of January, and the water had already risen high enough that many trees were standing in the water. Due to the high water levels, we could glide in between those trees and see a side of the forest that I had never seen before. Have you watched the Disney movie Ariel? Remember that scene where they were sitting in a boat, in between those trees with vines hanging down on them? My friend mentioned several times that she was reminded of this scene and I agree with her. It was a beautiful landscape and even without the animals, it would have been worth visiting for the scenery alone. Not to mention that besides those inundated forests, we saw giant lily pads and lakes filled up with water lettuce. I loved the scenery so much that I found it hard to put my camera away. 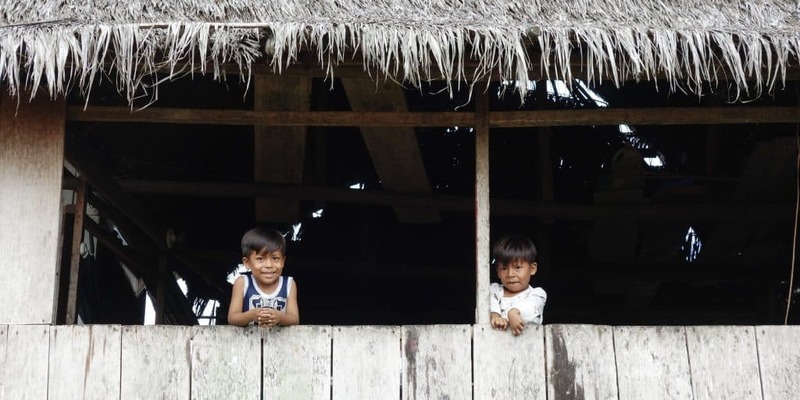 Have you ever wondered what it is like to grow up in a tiny community in the Amazon region? This is your chance to find out! We stayed at Libertad Jungle Lodge, which is a community-based project. The lodge is constructed next to a village and besides certified jungle guides, many locals from the area work here. The lodge offers employment opportunities and at the same time gives visitors a chance to experience life in the jungle. One morning, we went into the community and our guide showed us around. I saw the newly constructed school, met one of the teachers, had a group of young boys ask me if I wanted to have a picture with them and learned how to braid bracelets with one of the girls. We even got invited into one of the huts where an elderly woman told us the story of her village! No matter which parts of Peru you have seen, the culture in the Amazon region is very different and you can only experience it by visiting. I don’t think I’ve ever been to a place where I got to try as much exotic fruit as in Iquitos. From camu camu to sapote, most of the fruit I tried was delicious and foreign. In fact, I found it so interesting that I couldn’t resist writing a blog post about it. Besides lots of fruit and juices that I already miss, I also got to try some more exotic foods – like piranha. Two girls from Spain went fishing with their guide and brought home a couple of piranhas. The guide handed them to the chef and they got to eat fish for dinner! I couldn’t imagine a better way to end a day. 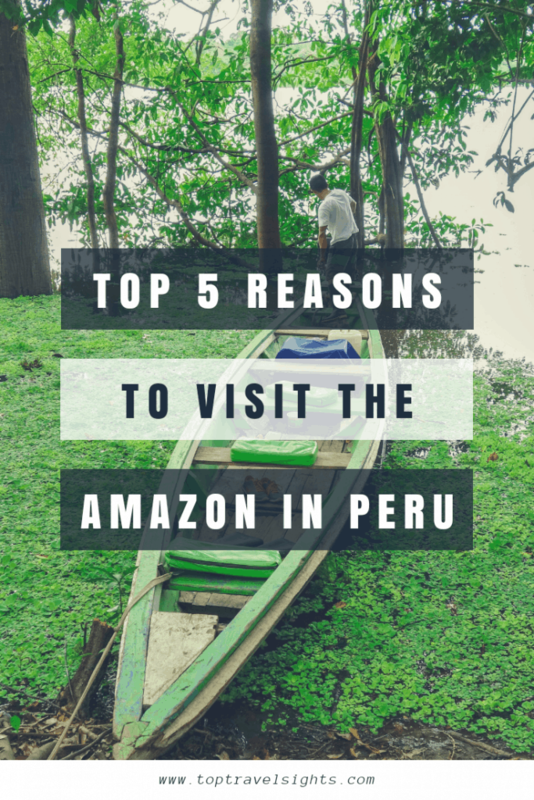 Have I managed to convince you that you should fly to Iquitos and visit the Amazon in Peru? I hope I have because it would be a shame if you missed out on this amazing experience. As I mentioned before, I stayed in the Libertad Jungle Lodge. What I love most about the lodge is that it gives back to the local communities. I had a really great time there. As mentioned, our guide was amazing and we had great food. All activities were included and it was up to us to choose what we wanted to do. If you google, you will find plenty of other options. Make sure the guides treat locals and nature with respect. It might look cool on photos if you get to pick up animals, but in the long run, these practices harm them and slowly destroy our nature. I would love to have some feedback from you. Leave a comment and tell me if you’ve ever done a jungle tour or if I’ve managed to convince you to go on one. Also, check out a more personal tale of my trip to Iquitos. The amazon is great, quite beautiful scenery. Love the photos. Thank you! The Amazon was amazing, I loved it. Sign up below to receive the latest updates from Top Travel Sights straight into your inbox!